Found one file extension association related to CopyTrans and 1 file format developed specifically for use with CopyTrans. Your iTunes library is empty, but your music is still on your iPod Touch? Do not connect your iPhone to iTunes without an iPod backup and risk an unwanted synchronization and deletion! Copy iPod to computer and safely recover iPhone or iPod Touch library. 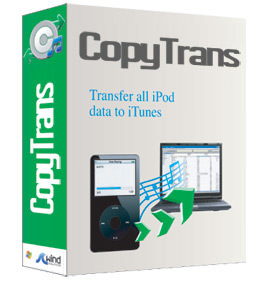 CopyTrans transfers: music, videos, podcasts, audiobooks, smart playlists, artworks, ratings, playcounts, date added and many more! Backup iPod to PC and iPhone to iTunes the correct way! If you need more information please contact the developers of CopyTrans (WindSolutions), or check out their product website.